Our Bottle Coolie is perfect for any bottled beverage, whether it be water, tea, or soda. These bottle coolies not only keeps your drink cold and your hands dry, but has proven to be beneficial in promoting your company or event. 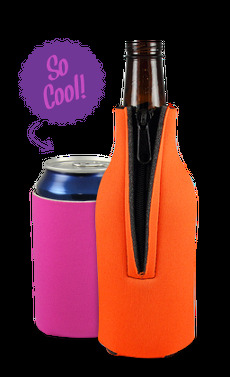 This custom bottle koozie folds flat to fit into your pocket for ease of transportation and is equipped with a clip, handle and a belt loop adding function to mix. Bottle koozies are designed for most 12 oz bottled beverages and made with 1/8" thick, high-quality scuba material right here in the U.S.A. to ensure maximum insulation for a longer period of time.